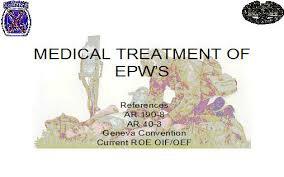 This lecture focus to present Medical Treatment of EPW’s. EPW means Enemy Prisoner of War. Medical Treatment camp provide adequate personnel, materials and facilities, for adequate routine and emergency care of EPWs. Enemy Prisoner of War patients requiring hospital treatment are moved, if possible to a civilian hospital, if unavailable, US military hospitals would used. Sickcall for the EPW’s desiring medical treatment should held each day and no experimental research would conducted on EPW’s. What are the Origins of State?